If you are a fan of chocolate butter pecan pie, this recipe was made just for you. The best part is they don’t require any baking time, just a few minutes to melt down a few simple ingredients, setting time in the fridge, and you are on your way to chocolate butter pecan heaven. You will have all the delicious flavors your favorite pie has to offer, minus the carbs and grains that will kick you out of ketosis. Many people on a ketogenic diet have problems getting all of their healthy fats in by the end of the day. One can only add so much MCT oil and butter to your morning bulletproof coffee. By the end of the day people find they are coming up short with hitting their fat macronutrient. This is where utilizing fat bombs like these can help make up that difference you need. In addition, fat bombs will also provide a few other benefits as well. When you are in ketosis, your primary fuel source is fat. This is used for every function in the body. Being fat adapted on a ketogenic diet will allow the body to run on both dietary fat on your plate or fat stores on your body. Gone are the days where you experience the dips in energy or experience slumps throughout the day when the body has switched fuel sources from carbs to fat. Fat bombs will help fuel those energy stores and keep you running at optimal levels. A little goes a long way with fat bombs. Not only will you feel satiated from eating a small portion, but they are a great way to kill your sweet tooth quickly. An added bonus with these fat bombs is the coconut butter provides a natural sweetness so they do not require a large amount of any additional sweeteners. 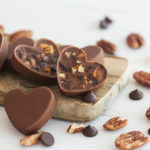 Fat bombs don’t always have to be sweet, nor do they have to be used as dessert. They can be used as snacks, meal replacements, or even a side dish on your keto diet. The base in these fat bombs is coconut butter and cacao butter, but you can easily change things up and use something like cream cheese or even plain butter and create something savory. Use herbs, spices, vegetables, and other keto friendly ingredients to keep things fresh and new on your keto meal plan. Whether you need something to tame your sweet tooth, need extra fuel in your tank for increased energy, or simply need a quick on the go snack option fat bombs are a wonderful tool to incorporate on your keto diet. Don’t be afraid to experiment and play with your ingredients. The most important thing to remember with keto is fat equals fuel. Get healthy fats into your diet and put those chocolate cravings to rest once and for all with these butter pecan fudge bombs. Add pecans to a small pot and toast under low heat for 3-5 minutes, just until lightly golden brown and fragrant. Remove from heat, let cool, and roughly chop. Set aside. Add remaining ingredients to pot and melt on low heat until smooth. Stir in chopped pecans. Adjust sweetener id needed. Remove from heat and pour into silicone molds. Place them in the freezer for 1-2 hours or until firm.